Champion jockey Damien Oliver produced a gem of a ride to land the prize on progressive stayer Bajour at Sandown on Wednesday. The New Zealand stayer was back last on the fence as the field entered the straight in the 2400m BM78 event, before Oliver produced some magic to track through the field and pounce on the lead in the shadows of the post. "I was concerned mid-race when he was back last and on the inside, but you should never doubt such a good rider and you can't ride them any better than that," said trainer Danny O'Brien. The win was the gelding's second in five starts in Australia and Oliver said more wins were in store. "It was a very good performance. Coming down the hill I didn't think we could win going around them so I stuck to the inside and the luck came our way, but he had to be good enough to get the job done and he did," Oliver said. "In the right grade over this trip he will be highly competitive." 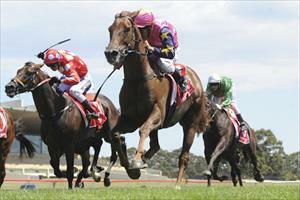 O'Brien is looking towards the 2400m BM84 at Caulfield on Australia Day as the next target for the son of Volksraad.